Vijay Anand's enjoyable 1963 romantic comedy�Tere Ghar Ke Saamne�showcases two bellicose neighbours for whom the axiom 'Love thy neighbour' is pure anathema. Until till the Dev Anand-Nutan amour melts their hearts. Om Prakash (who plays Jagannath, affectionately called Lalaji) and Seth Karamchand (Harindranath Chattopadhya) play the two crusty old rivals. Whether it is an auction for a plot of land or a contest for the post of president of a club, the two old men turn everything into a battleground of wits or muscle power.�Fortunately, they stop at nabbing each other by the collar. Unaware of their hostility, Jagannath's architect son Rakesh (Dev Anand) falls brick, cement and mortar for Sulekha (Nutan), the sprightly daughter of his father's rival. Like their fathers, Sulekha and Rakesh begin by exchanging glares and sharp retorts in their first encounter. He assumes she is a briny shrew while she assumes he is a reckless Romeo. Subsequently, they get better acquainted and end up professing love to each other. Both Lalaji and Karamchand appoint Rakesh as their architect. Each also forewarns Rakesh that the house he designs should be better than his rival's. To add to his woes, both Lalaji and Karamchand zero in on the same design�for their respective houses. Rakesh now has to juggle frantically while keeping his crazed clients at arm's length from each other. When the cat finally leaps out of the bag, Sulekha is aghast and alienates Rakesh. He eventually wins Sulekha over but the two dotty dads would still rather claw each other's eye out than see eye to eye. In a melodramatic climax, Rakesh sends out his wedding invitations without intimating Sulekha or their parents. The two fogies refuse to cede to the fait accompli. While the guests�have already arrived, Rakesh appeals to his father's paternal feelings while simultaneously reasoning with Sulekha's father that love begets love. * Interestingly, Rakesh's and Surekha's houses, unveiled on his wedding day, are mirror images of each other. The underlying message (that all human beings are identical beneath their prickly differences) couldn't have been laid on thicker. * Forget the fact that Dev Anand has just breasted 40 (he looks at least a decade younger) and forget the fact that this film was Nutan's comeback after the birth of son Mohnish. These two stars together mean surefire chemistry. * Dev Anand exudes boyish charm and looks totally besotted. He makes a confident suitor while Nutan thankfully does away with exaggerated coquetry or coyness. * Tere Ghar Ke Saamne gives abundant evidence of the fact that Nutan, unfairly slotted as a dramatic actress, was versatile. She could play a charming gamine too and, more important, was a comedienne par excellence. Watch Nutan in the scene where we see her throwing open the balcony door after Dev has combed Simla looking for her while singing Tu kahan yeh bata. She lights up like a 1000-watt bulb and fills the screen with her radiance. * The nonsensical word play between Chatopadhyay and Om Prakash contributed to the film's zany tone. They called each other names like khoosat (old man), muchhad (a person with an exaggeratedly bushy moustache), aloo bukhara (a dry fruit), gootter goo (cooing pigeon) and ainakwala akhrot (bespectacled walnut). * This film was one of those rare occasions when S D Burman joined forces with and Hasrat Jaipuri to create a winning score for Navketan. At most times in the 1960s, S D Burman made a team with lyricist Shailendra or Majrooh. * Mohammed Rafi sang as many as five songs for Dev Anand including three solos. r Ke Saamne the frosting on the cake is Vijay Anand's imaginatively picturised songs that lends a certain depth and throb to the stars' interactions. * His talent for song picturisation is best showcased in the number where Dev Anand visualises Nutan in his glass of whiskey, when he splashes a cube of ice into the glass. Nutan, who is presumably standing inside, literally shrinks away from it. * Despite his ability to raise chunks of chuckles and hearty guffaws, Vijay Anand never attempted a full-length comedy again. * Dev Anand and Nutan's four-film association (Paying Guest, Baarish and Manzil were the other three) culminated with Tere Ghar Ke Saamne. * Zarine, now better known as actor Sanjay Khan's wife Zarine Khan, played Dev Anand's anglicised secretary. She was romantically paired opposite funster Rajendranath, who played Nutan's supportive, modern-thinking brother. This was Zarine's only film as an actress. 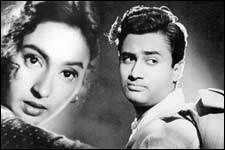 In this film Nutan and Dev Anand looks a very romantic couple. Their expression shows a real lover pair. both are looking great with each other and they have acted extremely well therefore to grrrr....8 to comment . � 1996 - 2005 rediff.com India Limited. All Rights Reserved.